You're looking LIVE at Neyland Stadium. It's T-minus three hours until the game and we're already in the press box, towering over the field below (seriously, these seats are waaaaay up here). I'll be updating this post with information up until the game starts, so continue to check back every now and then. For you gamblers out there, Tennessee's favored by 2.5 points. The over-under is around 52. Not that the blog condones gambling. And in case you're interested in following the blog on Twitter, you can do so here. It'll still be a while until we get any kind of lineup changes, player information, etc., so I'll leave you with this picture of the Sunsphere I took on the way in. Sadly, I did not make it to the discount wig store that's at the top. Auburn is seeking its third 5-0 start in the last six years. The Tigers won at least 11 games and went to a January bowl game in each of those other two seasons. Gene Chizik has won 19 consecutive games as a member of Auburn's staff, dating back to his time as a defensive coordinator in 2004. Chizik has never won a road game as a head coach, going 0-11 in his two years at Iowa State. The Tigers have trailed in every game they've played this season. Auburn is third in the country in scoring offense (45.3 ppg) and tied for third in total offense (526.3 yards per game). Auburn has scored 181 points through four games, only 27 fewer than it scored all of last year. The Tigers have scored in every quarter this season. They've scored touchdowns in 15 of 16 quarters. Auburn has topped 400 yards of total offense in its first four games for the first time since 2000. The Tigers entered the day with the most interceptions in the SEC (8). Tennessee quarterback Jonathan Crompton entered the day with the most interceptions thrown in the SEC (8). Auburn is tied for fifth in the nation in turnover margin (+1.75), tied for fourth in interceptions (8) and tied for fifth in turnovers forced (12). Quarterback Chris Todd has nine touchdowns in the last two games. He threw five all of last season. Auburn, as a team, threw only seven last year. Todd is second in the nation in yards per completion (16.32), is tied for third in TD passes (11) and is sixth in passing efficiency (171.05). Auburn has not lost to Tennessee since 1999. 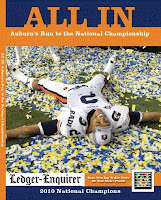 The Tigers won 28-21 in Auburn in 2003, 34-10 in Knoxville in 2004, 38-28 in the SEC championship game in Atlanta in 2004 and 14-12 in Auburn last year. The Tigers' four-game winning streak matches their longest in the series history (1961-64). Nine of the last 12 games in the series have been decided by 10 points or less. This is the first meeting since 1982 in which neither team is ranked. 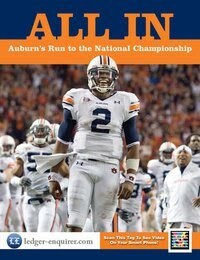 CORRECTION: Auburn leads the all-time series 26-21-3. (Thanks to the many who gave me the heads up about the earlier mistake). The Vols are 14-8-2 in games in Knoxville. One other note: CBS announced that the 3:30 game next week will be Alabama-Ole Miss. By process of elimination, that means Auburn's game at Arkansas will be in the morning, on ESPN at 11 a.m. CT or on the SEC Network at 11:21 a.m. CT.
WR/PR Philip Pierre-Louis made the trip and is on the field working with the punt returners in the pre-game. Chizik has held the redshirt freshman out of action all season. Seems like he would have to play a role if he's on the traveling squad. He's wearing No. 42, by the way. Tennessee is wearing an all-orange ensemble tonight. Don't know what to read into this, but QB Barrett Trotter is in the stadium and dressed out tonight, wearing No. 14. My guess is he's integral in relaying in the offensive signals. I can't imagine he's physically recovered yet from last spring's ACL injury. WR Kodi Burns doesn't look like he's bothered by last week's thigh injury. He's dressed and warming up with the receivers. Same with RB Onterio McCalebb, who doesn't look like he has any brace on the ankle he injured last week. I do not see suspended RG Byron Isom during warmups. It looks like he did not travel. It might only be warmups, but junior Bart Eddins is working at right guard with the first-team offense right now. Just announced: Eddins will start at RG. You are incorrect. Auburn leads the series. By the way, you have the number of wins and losses right, just for the wrong team. What Steve said. 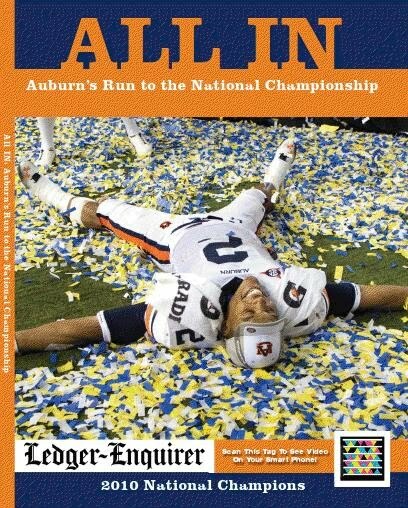 AU has a winning record against all SEC teams except LSU and that other team up the road. I'm an idiot. It's fixed now. Thanks.